911 Restoration Baltimore is the fresh start company that aims to provide you with the highest quality of water damage repair and restoration that will make your home look good as new after a flood, roof leak, sewage spill, pipe burst, or water-based appliance hose rupture. Through our fast action we can protect your home from further harm and get it back in shape as soon as possible. When we arrive, we will be conducting a free assessment of your property. With this inspection, we can recommend the right solutions at the most affordable price. Once we know what needs to be done, our licensed, insured, and bonded water damage Odenton specialists with 911 Restoration Baltimore can work on the restorations that will give your home a fresh start today! It’s going to take the right process to take care of the damage done by that roof leak, pipe bursts, sewage spill, or flood. Water damage Odenton experts will be providing a comprehensive approach in order to take on all the challenges presented. Free visual inspection. This is the step that will help us get started on the right track. Rest Whenever there’s a leak, we’ll be available 24/7/365 to inspect your home. Water Extraction. When roof leaks and pipe bursts cause flooding within your home, we will extract water using our advanced drying equipment. Locating moisture spots. Getting rid of the moisture left behind is critical in order to prevent mold growth or wood rot. We’ll be checking for moisture spots using our thermographic cameras. We will dry these moisture spots using our advanced equipment. Decontaminating affected areas. Sewage spills are among the most dangerous water damage situations because of the filth they can bring in to your home. Those biological contaminants can cause severe damage to your property and spread all kinds of diseases. Once we extract sewage out, you can count on us to disinfect the affected area using our industrial strength cleaning solutions. This will kill bacteria and remove foul odors without causing any additional damage. Complete property restoration. We will repair roof damage, remove water stains on the ceiling patch up damage to the plumbing, replace ruptured hoses on water-based appliances, and refurbish your home to look good as new! 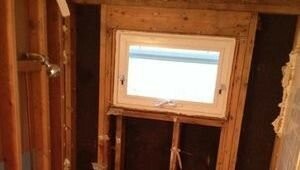 911 Restoration’s water damage Odenton pros have over three decades worth of experience in helping homeowners take on a wide variety of water damage concerns. Don’t let your home suffer from the ill effects of a water damage situation without getting help from the best in the business. 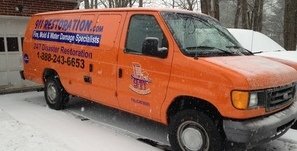 Contact our water damage Odenton team with 911 Restoration Baltimore for immediate relief today! Through top quality water damage repair and restorations, 911 Restoration Baltimore will be taking care of those roof leaks, sewage backups, flooding, pipe bursts, storm damage, or water-based appliance hose ruptures affecting your home. Our water damage Odenton technicians will get right to work on your home immediately through our quick response time of within 45 minutes. We need to work on these water damage situations right away because of the dangers a leak can eventually cause such as wood rot and mold growth. Our experts are well aware of how trying these times can be for folks, and this is one of the many reasons why we offer to fill out the insurance paperwork for our clients. This way they don’t have too much on their plate all at once, and they can get back to life as normal in no time. Through the thorough process we have, we can offer the complete solutions that will give your home a fresh start. If your home or business suite is already dealing with a black water invasion or any other form of flooding, then don’t wait another second to contact our water damage Odenton team with 911 Restoration Baltimore for help today!